Ann Sudmalis, Federal Member for Gilmore and Allen with wife Dearne. The Bay Push together with Eurobodalla Shire Council is building an inclusive playground at Corrigans Reserve. Plans have been approved by council with a playground set to cost $1.6M with just on $600000 raised so far. So it is especially good news when locals step up to assist. As reported in the Bay Post, an announcement by the Federal Government was made when Julie Bishop, Foreign Minister and Gilmore member, Ann Sudmalis recently visited, that they had approved a grant application of $10000 toward a kid’s spinner see photo insert. This left $13000 to complete the purchase. Allan Rutherford, President of the local Chamber of Commerce and wife Dearne met recently with Geoff Fielding of The Bay Push and said “our business, Coastal Auto Group, Batemans Bay, has had a good year and will donate the difference for the spinner”. When asked why they were interested in the building of an inclusive playground, Allan answered; “my brother and Dearne’s sister both have a special needs child and we have been involved with early intervention programmes since or niece and nephew were born. An inclusive playground is a great thing for the wider community as we all know someone young or old with special needs. Allen also said his business had a wonderful team of people that have been well supported by the local community and on their behalf we want to give something back”. 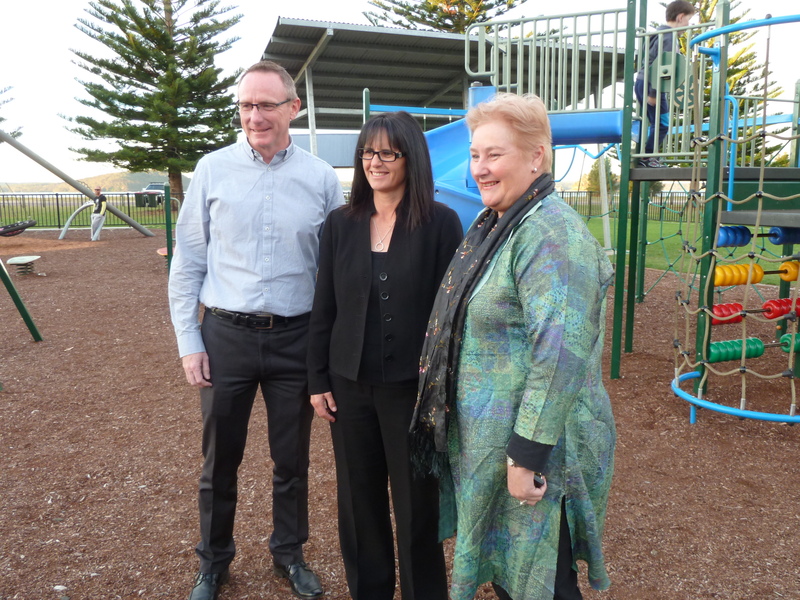 Photo – Ann Sudmalis, Federal Member for Gilmore and Allen with wife Dearne.